Javier Duarte fled to Guatemala before being extradited back to Mexico in July 2017. MEXICO CITY — Mexican prosecutors said Thursday that the former governor of Mexico's Gulf coast state of Veracruz has pleaded guilty to charges of organized crime and money laundering. The plea deal was an anti-climactic end to Mexico's highest-profile corruption case in recent years. 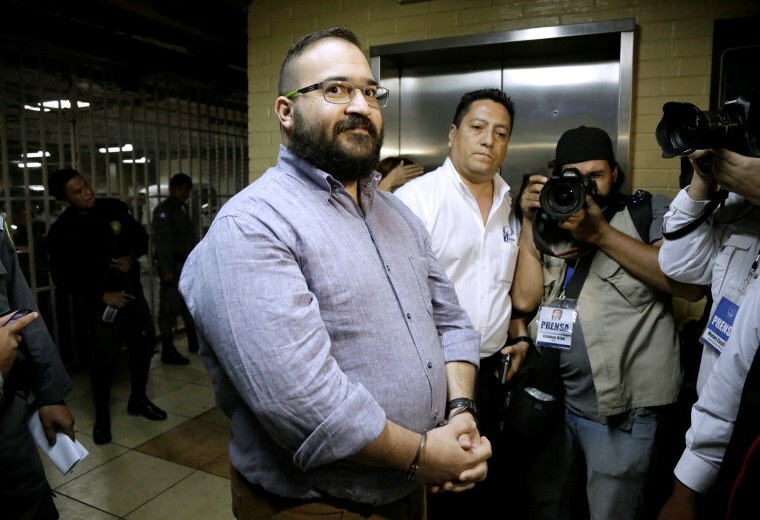 Javier Duarte took a leave from the governorship of Veracruz and fled to Guatemala before being extradited back to Mexico in July 2017 to face justice. Duarte got a nine-year sentence and had 41 properties seized as part of the plea deal. But Duarte will not have to pay reparations, and could apply for parole within as little as three years. "In cases like these, we are never satisfied," said federal prosecutor Felipe de Jesus Munoz. "We have to follow what the law says." Munoz said that after serving 4½ years — half the sentence — Duarte could apply for parole, and that he will be credited for the 1 ½ years he has already spent in prison. But current Veracruz Gov. Miguel Angel Yunes said that despite the federal plea deal, Duarte still faces an array of state charges. "It will be many years before Duarte gets out of prison," said Yunes. Prosecutors said Duarte embezzled millions in state money and used much of it to buy properties. Duarte won't be required to pay back all he took under the federal deal, but Munoz said the value of the properties already seized was "very significant" and was almost equivalent to reparation. Yunes said that state authorities estimated that a total of about $120 million in properties, money and possessions had been seized from Duarte. And Yunes revealed that state prosecutors have issued a warrant for Duarte in the case of the forced disappearance of over a dozen people in Veracruz during Duarte's 2010-2016 administration. However, Yunes said Guatemala — which initially agreed to extradite Duarte only to face the corruption charges — must still agree to allow him to be tried on the abduction charges. Charges have already been brought against about 20 former Veracruz law enforcement officials who allegedly kidnapped and killed 15 innocent civilians. Duarte was one of a string of other governors from the former ruling Institutional Revolutionary Party who were charged in corruption cases. They include fugitive former Chihuahua Gov. Cesar Duarte and ex-Gov. Tomas Yarrington of Tamaulipas, who was arrested in Italy. Public disgust with the ex-governors is believed to have played a role in their party's crushing defeat in the July 1 presidential and state elections.